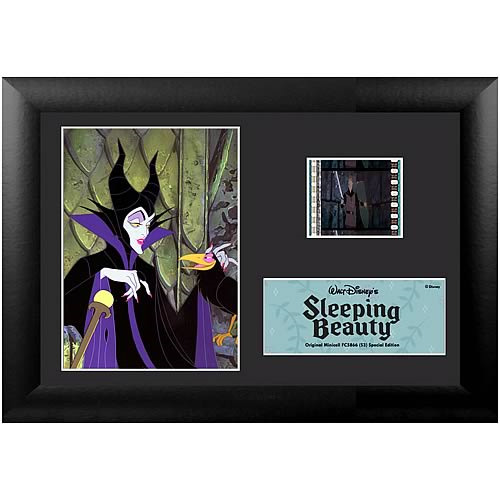 Shopping for Sleeping Beauty Film Cells? When Princess Aurora is born, the entire kingdom is delighted, except for the evil fairy Maleficent, who places a curse on the young beauty that only a prince can break. Sent into hiding for her own safety and protected by fairies Flora, Fauna, and Merryweather, "Briar Rose" lives in the forest, unaware of her royal blood. Yet despite everyone's caution, the princess's destiny plays out as she pricks her finger on the spindle of a spinning wheel, falling into a deep sleep. its up to the daring Prince Philip to brave the fire-breathing dragon and awaken the sleeping beauty with true love's kiss. The film strip portrayed in the image above is only an example of the film cells you may receive. Please note, the cells may vary from piece to piece because they are hand selected from reels of film. This item contains clips of the film and portrays memorable images and scenes all on a stunning descriptive plaque. These elements have been double mounted and placed within a beautiful black wood frame measuring 7 1/2-inches wide x 5 1/2-inches tall. The Sleeping Beauty Series 3 Special Edition Mini Cell even comes with a certificate of authenticity.